Last year, James Hetfield stated emphatically his opposition to remixing …And Justice For All to give Jason Newsted’s barely audible bass guitar a more prominent presence, preferring to conserve the album’s original character accurately, for better or worse. Hetfield, Kirk Hammett, and, unsurprisingly, Newsted himself, have expressed dissatisfaction with the album’s sound, innumerable articles have explored the reasons behind the imbalance (chief among them the fact that Newsted’s bass lines closely mirrored Hetfield’s guitar lines and competed for the same frequency bands), and fans have even uploaded their own remixes to YouTube. Still, no dice. 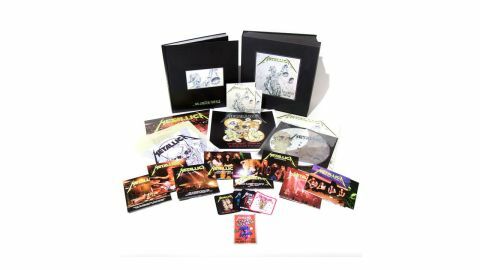 Nevertheless, any disappointment at the band’s resolute refusal to fix the flawed original mix of Metallica’s most complex record is liable to be compensated by the copious vault-purging artefacts spread across the 11 CDs, four vinyl LPs, DVDs and ephemera that comprise this Deluxe Box Set. Newsted’s contribution to Justice is also made clearer, via a wealth of demos and rough mixes, which provide a vivid illustration of the sheer graft that went into the creative process, with Metallica refusing to become complacent or tone down their sound as their stature increased. Newsted also resonates through the three crushing Damaged Justice live shows, and the remastering of the original nine songs adds a warmth and fullness which enhances the moments during which the bass is more discernible. Flaws aside, back in 1988 Justice was mostly greeted with enthusiasm by fans and critics, praised for the musicianship displayed in the labyrinthine song structures, the dizzying changes of Blackened and the title song a logical extension of earlier tracks like Master Of Puppets. And for disciples of the riff it’s hog heaven, each song a stream of memorable motifs. Weaker moments occur as To Live Is To Die drags early on and Harvester Of Sorrow plods, and Dyer’s Eve lacks the lasting melodies of previous thrashers such as Damage Inc, but each has redeeming elements, and the otherwise high calibre of what’s on offer wins out overall. Justice marked the moment at which Metallica, having survived the tragic loss of bassist Cliff Burton, entered the big league, playing arenas and cracking the Billboard Top 10. This immersive collection captures the excitement of an era sometimes overlooked between their twin peaks of Master Of Puppets and the Black Album.